Harvard University Press, 9780674979406, 352pp. Many books offer information about China, but few make sense of what is truly at stake. 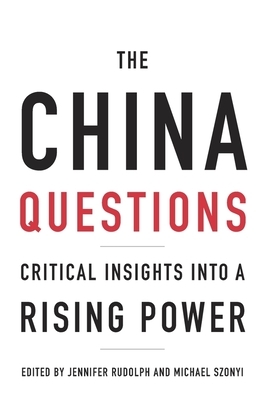 The questions addressed in this unique volume provide a window onto the challenges China faces today and the uncertainties its meteoric ascent on the global horizon has provoked. In only a few decades, the most populous country on Earth has moved from relative isolation to center stage. Thirty-six of the world's leading China experts--all affiliates of the renowned Fairbank Center for Chinese Studies at Harvard University--answer key questions about where this new superpower is headed and what makes its people and their leaders tick. They distill a lifetime of cutting-edge scholarship into short, accessible essays about Chinese identity, culture, environment, society, history, or policy. Can China's economic growth continue apace? Can China embrace the sacrifices required for a clean environment? Will Taiwan reunite with the mainland? How do the Chinese people understand their position in today's global marketplace? How do historical setbacks and traditional values inform China's domestic and foreign policy? Some of the essays address issues of importance to China internally, revolving around the Communist Party's legitimacy, the end of the one-child policy, and ethnic tensions. Others focus on China's relationship with other nations, particularly the United States. If America pulls back from its Asian commitments, how will China assert its growing strength in the Pacific region? China has already captured the world's attention. The China Questions takes us behind media images and popular perceptions to provide insight on fundamental issues.